Being physically active can prevent and help treat many of the most common chronic medical conditions associated with old age. Physical activity is one of the most important steps older adults can take to maintain physical and mental health and quality of life. Scientists have proven that being active can help reduce the risk of obesity, high blood pressure, diabetes, osteoporosis, stroke, depression, colon cancer, and premature death. Yet today, more than 60% of older adults are inactive. Older adults face the same obstacles to being more physically active as younger adults but also have special concerns. Getting older adults to be active is a challenge. The average American lives a long time, but many are sedentary, physically unfit, and experience disability from chronic medical conditions as they age. Physicians and exercise experts hear many reasons from older adults as to why they are not active: It doesn't feel good. It makes my arthritic joints hurt. It takes too much time. It's boring. However, older adults need physical activity like everyone else, at least as much as younger adults. In fact, the loss of strength and stamina often attributed to aging is in part caused by reduced physical activity. Walking groups and physical activity programs especially designed for older adults can help seniors become—and remain active. 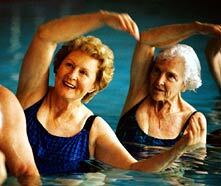 For example, senior swim clubs and water aerobic classes are excellent activities for people with arthritis. Strength training is recommended for all adults, but it is a vital link to health for older adults. The reason is that strength training prevents sarcopenia, the muscle deterioration that comes with aging, and also helps maintain bone mass. "Stronger people have better health outcomes," noted Dr. David Buchner, Chief of CDC’s Physical Activity and Health Branch and renowned Gerontologist. However, some elderly people avoid physical activity and become sedentary out of fear of falling and fracturing a bone. Dr. Buchner added that emerging data indicate that physical activity can prevent falls by improving strength, balance, and endurance. For more information about strength training for older adults visit our Growing Stronger: Strength Training for Older Adults Web site. Aerobic activity (also known as cardiorespiratory or cardiovascular endurance activity) is also important. It keeps the heart strong, lowers blood pressure, and relieves anxiety and depression. Older adults can obtain significant health benefits with moderate physical activity, such as walking or gardening. "We need to make physical activity part of the daily routine for older adults," said Dr. Buchner. Health clubs also provide older adults with a variety of opportunities to improve their aerobic fitness, muscular strength, and flexibility. Dr. Buchner adds, "Traditionally health and fitness facilities have marketed mainly to body-conscious younger adults, who focus on the cosmetic effects. 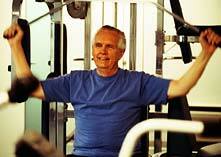 It's great to see that health clubs have developed more programs for older adults, and we hope this trend continues." *The above information was adapted from: CDC, NCCDPHP. Special focus: healthy aging. Chronic Disease Notes and Reports 1999;12(3):10-11. Cardiorespiratory: Participate in moderate-intensity aerobic activities 3-5 days a week for at least 30 minutes each session. Strength training: Do strength-building activities 2-3 days per week. *Flexibility refers to how fully one’s joints or limbs are able to move. Being flexible allows for easier movements and reduced pain in joints so that it is also easier to perform daily activities of independent living. By adding stretching to your daily physical activity plan, you can help keep your joints flexible which will help you move with more freedom and comfort. Participating in these types of activities can help you more easily perform many of your day-to-day tasks. For example, being more flexible will help you more easily do things like reaching in your cupboard and tying your shoes. Being stronger and having more balance will help you lift and carry items like sacks of groceries and will make it easier to get in and out of chairs and the bathtub. Improving your cardiorespiratory endurance will allow you to do things like climbing stairs, dancing, or playing with grandchildren without getting out of breath. The chart below provides ideas of activities in the areas of cardiorespiratory endurance, strength, and flexibility. Many of these activities will also help improve your balance. Most importantly, choose activities that you enjoy. This will make it more likely that you’ll keep doing them! Including cardiorespiratory, strength, and flexibility activities in your weekly routine may sound like a challenge. 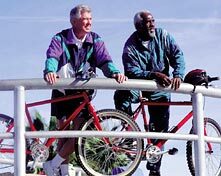 See a sample physical activity schedule for healthy older adults that incorporate activities from all three areas. It can be difficult to make a change in your daily routine. Still not sure how to begin? Check out Adding Physical Activity to Your Life for tips on how to be more active every day.